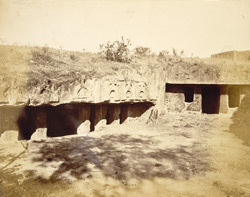 Photograph of the entrance to the Buddhist Caves, Junagadh taken by James Burgess in 1874 or 1875. The town of Junagadh stands at the foot of the sacred Girnar mountain. It was the capital of Gujarat and an important monastic centre between the 2nd and 4th Centuries. The Kshatrapa rulers of Junagadh sponsored the excavation of a number of caves for use by Buddhist and Jain monks. These consist of square cells arranged on two levels and they are furnished with winding staircases and bench seating. The richly carved columns on the lower level have pot-like mouldings at the base and groups of figures on the capitals. These pillars can just be made out in this photograph. This is a view of the entrance to the caves.